John Hutchinson was a well-known botanist. He travelled around South Africa from Aug 1928 - Apr 1929, and in southern Africa from June - Sep 1930 with General Smuts. His book contains is well illustrated with interesting black and white photos of scenery. The text refers to his plant collections and occassional travel stories. There is minimum reference to fauna in the text or photos, except for several illustrations of weaver nests. There is a line drawing of a weaver nest (probably Cape Weaver) drawn on his journey from Cape Town to Caledon. 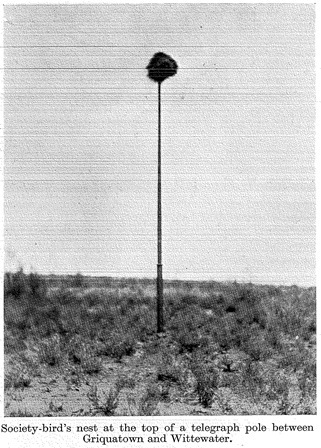 Although the book was only published in 1946, the photo of the nest on the telephone pole was taken on 23 Feb 1929 and is one of the earliest records of Sociable Weavers nesting on these man-made structures.